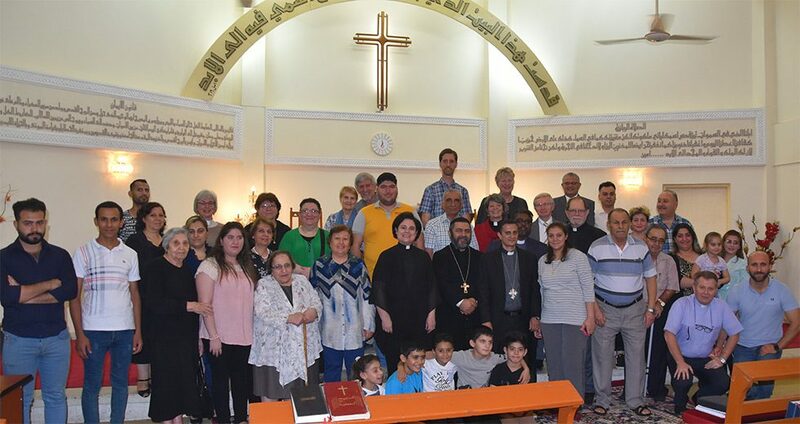 The strength of hope continues to drive the few remaining Presbyterian churches in Iraq, a World Communion of Reformed Churches (WCRC) delegation found on a recent visit. “Although they are very few, they have a vision of hope where they see their role in society as something very vital,” said Najla Kassab, WCRC president. The delegation—composed of representatives from the WCRC, National Evangelical Synod of Syria and Lebanon, Presbyterian Church (USA) and Synod of the Nile—spent more than a week in October visiting with the leaders and churches of the National Evangelical Presbyterian Church in Iraq (NEPCI), which are not yet members of the WCRC, in three different cities. “One of our main goals of this solidarity visit was to help pastors and elders sit together and start to think about their needs as churches—and the role they can play in supporting one another and empowering the ministry of these three churches,” said Kassab. They face many challenges, including societal corruption, high emigration, and leadership development. The WCRC’s three member churches each offered assistance to address some of these issues, most especially leadership development and reconnecting to the world. These offers were welcomed, as was a strong affirmation from Chris Ferguson, WCRC general secretary, that there was a place for the Iraqi churches in the Communion. “Hope thrives through relationships,” said Ferguson. Farouk Hammo, NEPCI president, said that they were looking to the WCRC not for mere support for their ministry programmes, but to belong to a global family of churches so as to enhance their standing in Iraq. Kassab’s presence as both a Middle Easterner and a woman created an unexpected opportunity: she was invited to join a church ministry’s visit to a women’s prison in Kirkuk. The church provides basic necessities to the imprisoned women—along with several babies who were born in the prison—including milk, diapers, candy, doors to bathrooms and air-conditioners. Despite their small sizes, the three churches run extensive programmes and projects. Besides the prison ministry, their work includes radio stations, refugee housing, water provision, a community gym and daycares, nurseries and kindergartens. At their final meeting prior to leaving Iraq, the delegation agreed to continue to coordinate efforts to bolster the work of the Iraqi churches, including the possibility of holding a consultation on reconciliation, peace and justice in Kirkuk—an invitation made by the governor of Kirkuk.